is Life on Mars a flimsy charm? 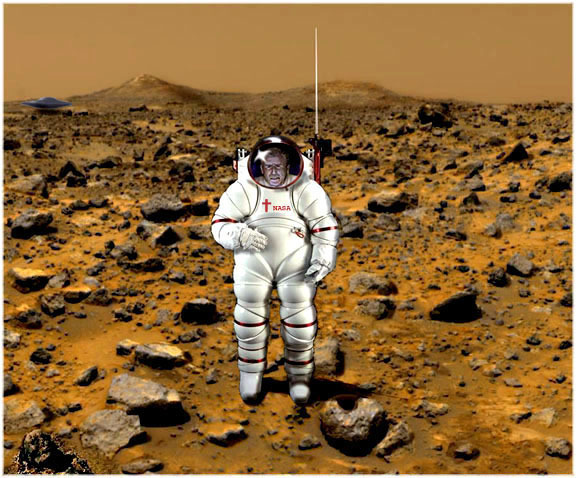 George Dubya is now committed to human exploration of the Red Planet. Men On Mars: Our Leader has spoken, The Visionary Pundit, Poet, Linguist, Rhetorician, Patriot, Scientist and Jet Pilot, George W. Bush has outlined the Road Map to Mars, A new frontier for us to conquer, Mars or Bust. adventure into the cosmos will be the conquest of places those Muslims would never dream of going." NASA photo of the Manned Mars Expedition. Press Photo taken at Mars Desert Research Station near Battle Mountain, Nevada. George Dubya is looking very very exploratory with his new hardended bullet proof uniform, he is off looking for evidence for his rationale for going to search for precious stuff and things to be dragged into heaps to indemnify his trip to a place that has no fund raisers, no atmosphere no voters and no brush to clear. "We're going because it's there, it's a metaphor for what the human spirit and our better angels can do and pray you don't have to poop and don't fall down". Men on Mars, coming soon. Exciting news for the Manned Mars Landing buffs. "It will be a push to get us up and out of earth's orbit and on to the business of going where no man has gone before, Now we've found methods to do it on the cheap. It's now on to the last frontier with the obsessive compulsive behavior that has distinguished our national character. It's time to plumb the heavens for man." Exobiologists seek to understand how life originated on Earth by studying chemical and physical conditions elsewhere in our solar system and our galaxy. The origin of life on Earth is not well understood but was evidently based on chemical evolution from simple compounds present on the newly formed planet to create a system of replicating organic chemicals. George W. Bush knows these things and is interested in further knowledge so no child will be left behind. Manned Mars Exploration is on the boards for two thousand twelve. One small step for George, one huge step for the Space Cabal. Lockheed Martin, Boeing, California Institute of Technology, Thiokol Corp. Raytheon Co., Allied-Signal Inc. TRW Inc., Computer Sciences Corp., EG&G Inc. United Technologies Corp., Johns Hopkins University, Science Applications Intl. Corp., to say nothing of us, NASA, next to the CIA and NSA, we are the biggest black hole in which our national resources can be cast  another jewel in the crown, Kellogg, Brown and Root (Halliburton) will supply all happy meals and despose of effluent. Planning is going according to plan. Updates Coming Soon. 2. Define the nature of early Martian environments and find any desirable mineral deposits that may be of value to our stated goals. 4. Devine methods for fund disbursal to major NASA contractors so as to spread the spoils in an even and equitable manner. 5. Develop new stuff and things, spin offs that can grow the economy here on earth. Example: Kellogg Brown and Root has already developed a freeze dried, irradiated ration for space travel or the battlefield. Called the Halliburger, this ration will last for twelve years while remaining soft and chewy as a marshmellow. The Halliburger as fast food is soon to be available at Walmart. In order to achieve these goals, Mars exploration spacecraft will visit sites where we may expect to find sedimentary rocks containing evidence of biologically-important minerals (such as carbonates, sulfates, phosphates) and preserved organic compounds. (Note that organic molecules are rapidly destroyed at the surface of Mars today by the intense ultraviolet light from the Sun -- light that, on Earth, is filtered out by our ozone layer). Mars exploration may even lead to the discovery of a fossil record of past microbial life. If microbes can be found there is the distinct possibility of coaxing new products to life. Our Leader put forth a feckless attempt to reconcile a need to believe, the utility of understanding and the feeling of being human. The fall back position for the population of Mars is resignation to the fruitless notion of saving the planet on which we were born; a more sinister description might imply that we were spawned to spoil. We saw the enemy. . .
martian chronicles -- plumb the heavens for man.